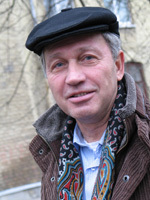 Born February 14, 1945 in Leningrad in the family of the artist – cartoonist Lev Samoilov. He lived with his parents in Talin, Riga and, finally, since 1959 – in Moscow. In 1970 he graduated from the Moscow Textile Institute. He began to publish in “Truda” in 1969. After serving in the army, he worked as a designer, drawing cartoons in parallel and printing them in various media, including in Crocodile, before closing it. A participant in contests of cartoons domestic and international. He was a laureate of several of them. He worked as the main artist in the newspapers: “The Master” (Appendix to “Trud”) and “Chimes”. Member of the Union of Journalists of the USSR and the Union of Designers of the USSR.